Of all the three versions of Hyundai's IONIQ, the Plug-in variant is arguably the cleverest. Jonathan Crouch takes a look at what's on offer. 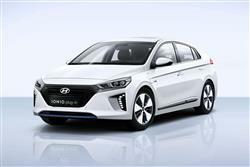 We can see why so many IONIQ sales will be of this Plug-in variant. When the government's Plug-in Car Grant is taken into account, it's hardly any more expensive to buy than the ordinary full-Hybrid derivative and it offers far more ownership flexibility, with its 39 mile all-electric driving range. No, it isn't very interesting to drive - but then few eco-models of this sort are. If though, for you, 'interest' at the wheel is defined by technology, you might find this car thoroughly satisfying. It's certainly state of the art.